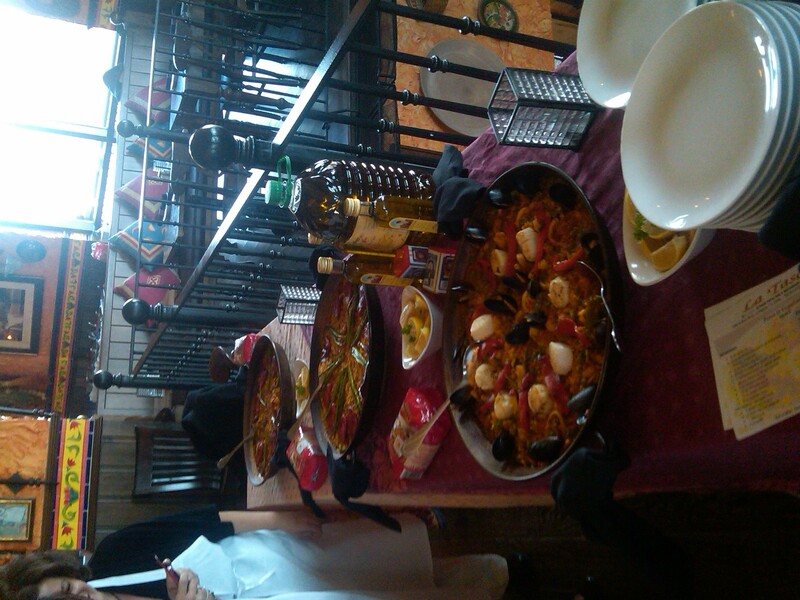 I took a paella cooking class on Saturday with my friend Gina. It was yummy! Gina found the class while dining at Las Tasca and since we are both fans of their paella- she signed us up. The class was taught by the Executive Chef (who is from Barcelona) and we learned how to make three different types of paella. Also, we both learned that it might just be easier to dine at La Tasca for yummy paella than making it in our own kitchens. (Excuse the picture but it was from my Blackberry). We made the traditional Paella Valencia, then one with all seafood plus grilled scallops and asparagus on top and one with chicken, Spanish choriza and grilled peppers on top. They were all delicious. The downside of paella is that the pan does not fit well on a standard stove top (they did have these handy burners that were fueled by propane but I am not up for cooking it outside on my deck) and the amount you make in the pan feeds 10 people. On the upside- we learned about a local Spanish food shop, where to by saffron, tips about cooking with tomatoes and paprika, got some great recipes (including two sangria recipes) and generally had a great time. They are going to have another round of classes this winter so if you are interested in Spanish cooking- let me know!